This meal involves just a few ingredients that work in concert to produce a lot of flavor. Barely a month into the school year, and suddenly, we’re swamped. Six o’clock sneaks up on my family, and we have a million balls in the air – soccer practice, dance class, pre-algebra homework, jobs – and none of them is magically making dinner. Still, my family needs to eat. So, I have a slew of super simple under-30-minute dinners that I can pull together in less time than it takes to get a pizza delivered. The trick is to keep the number of ingredients to a minimum, and select a fast-cooking protein, like boneless skinless chicken breast. 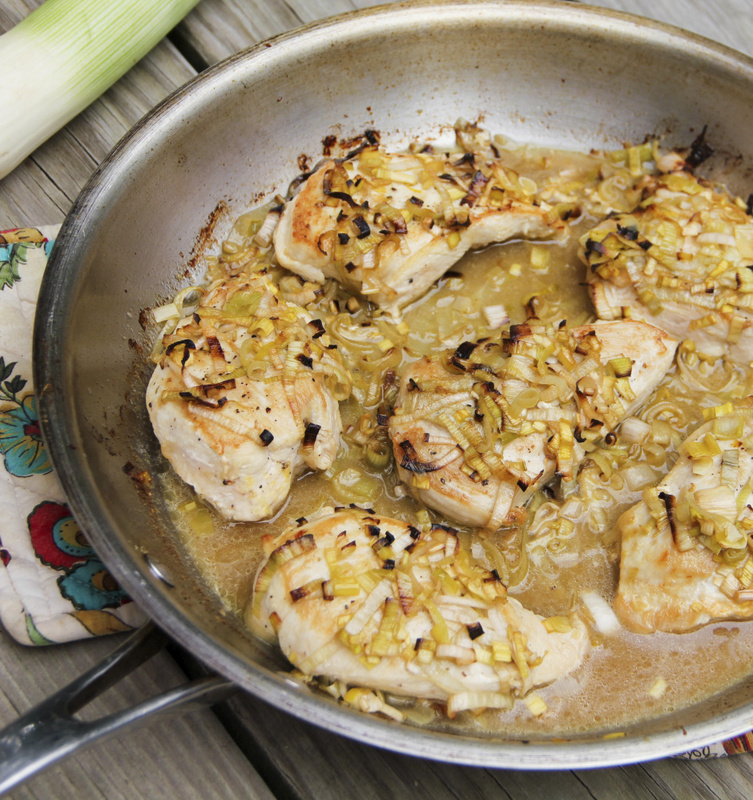 Quick Skillet Chicken with Leeks earns high marks on both fronts, making it an excellent addition to your weeknight dinner rotation. Just a few carefully selected ingredients work together to get a ton of flavor without a lot of fuss. Leeks are the star. If you aren’t familiar with them, leeks may feel a little exotic. Used frequently in French cooking, they look like an oversized scallion, and taste like a mellow, slightly grassy onion (but better – I hesitated to use the word grassy, but then opted for accuracy over enticement). Once you discover leeks and realize how hardy they are – they’ll last at least a week in your fridge – you’ll buy them and find ways to work them into your recipes. Almost any place you use onions, you could swap in leeks for a flavor tweak. Find them in the produce aisle, or with frozen vegetables. And, you can even freeze your own fresh leek slices if you want to stock up for a future recipe. Today’s recipe couldn’t be easier: pan-sear chicken, and spoon over sliced leeks mixed with a little melted butter, dry mustard, Worcestershire sauce and chicken stock, and then finish the whole thing in the oven for 15 minutes. By the time you set out the plates, dinner will be on the table. Preheat the oven to 400 F, salt and pepper the chicken. Brown the chicken in olive oil in oven safe skillet over medium high heat just until the first side is golden, about 3 minutes. In a medium bowl, mix together the sliced leeks, melted butter, chicken stock, dry mustard and Worcestershire sauce. Flip the chicken over in the skillet. Spoon the leek mixture on top of the chicken and place the whole pan in the oven to finish cooking, about 15 minutes, or until chicken is cooked through the leeks are tender. (If leeks appear to get too dry, place a sheet of aluminum foil light on top of the pan.) Serve the chicken with some sauce spooned on top.